Congress has passed legislation exempting Monsanto from any financial liability stemming from lawsuits and financial settlements related to PCB contamination and cleanup sites. The bill could have the effect of shielding the serial polluter from all liability related to its decades of PCB contamination all across the nation. From the 1930s until the practice was finally outlawed in the 1970s, Monsanto spread vast amounts of its then-signature chemical, polychlorinated biphenyls (PCBs), known by its brand name, Aroclors® across the US in the form of paints, plastics and industrial equipment. Monsanto, responsible for almost 1.25 billion pounds of carcinogenic PCBs sold in the US has already agreed to a $700 million settlement with plaintiffs in Anniston, Alabama for both compensatory damages and to assist in clean up costs for PCB contamination there. But that small victory for the forces of health and sanity in the massive, take-no prisoners, salt-the-earth-behind-you war Monsanto appears to be waging against health and autonomy world-wide may have had some tragic, unintended consequences. The huge drug, chemical, GMO and agrochemical corporation’s loss in the Alabama case appears to have sent their lawyers and lobbyists scrambling for succor from a pro-corporate, compliant Congress. And did this Congress deliver! By the EPA’s own admission, the chemicals Monsanto spewed all over the country are carcinogenic, harmful to reproductive, immune system, endocrine system, and nervous system health. Yet Congress has seen fit to gift one of the worst corporate polluters in US history with what amounts to a multi-billion dollar “Get Out of Jail Free” card. A provision slipped into a chemical safety bill was introduced by an “unknown representative” [Sic]. And although Monsanto isn’t named overtly in the bill, the provision would benefit it greatly, since they are the only US manufacturer of the now-banned PCBs. Add to that the fact that Congress has also taken away the rights of millions of citizens and an a huge number of municipalities to seek compensation for the damage done to their persons and land and you have a real Monsanto Moment which is a tragedy for people and their communities. Really? Just what would Monsanto consider a gift? Perhaps granting unlabled “substantial equivalent” status to its dangerous genetic-altering GMOs and nearly unlimited tolerance for its dangerous herbicide, RoundUp® (glyphosate)? Frankly, we find it disgusting to witness another instance of a bought-and-paid-for, craven Congress kowtowing to not only the rich and powerful, but also to those who have made vast fortunes spreading poison across the land. Every time one of these despicable sell outs makes a speech during the election season touting the wonders of, and their loyalty to, the great land of the United States of America, he or she should be slapped across the face with the carcass of a poisoned, rotting fish marinated in the PCBs their corporate patrons at Monsanto were kind enough to provide for us all for generations to come. Or the funeral announcement of a person who died of cancer from their friend’s poison. This vote is a heinous, odious exemplar of exactly what is wrong with the current pay-to-play legislative (and judicial) system. 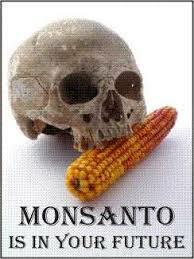 There is not a sane person in the world not on Monsanto’s dole who would make a conscious decision to let the people who poisoned their families and spoiled their land off the hook – permanently and totally. The cure? That will only come when We, the People, will no longer tolerate it and use our ballot, wallet and recall powers to stop it. has it actually passed or can we still stop it?